Recently, Lafayette Township Board of Trustees signed with Knoch Corporation out of Canton, OH as the primary contractor for the fire station project. 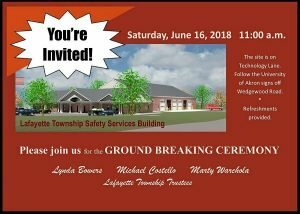 There will be a ground breaking ceremony on June 16, 2018 at 11:00 am at the job site located on what will soon be our new address of 6367 Technology Lane on the northeast corner of Technology Lane and Wedgewood RD. Please join us for the ceremony and light refreshments after. The station is slated to be completed and move in ready by late March 2019.